Chemical compound formulas provide a shorthand communication for the structure of molecules and compounds. Reading and writing the chemical formula of compounds requires just a little understanding of the language of chemistry. Science depends on precision of language to communicate effectively. The following definitions will help you learn how to write the chemical formula for different compounds. Atoms are the smallest particles of an element. Atoms cannot be broken down further and still retain the unique characteristics of the element. Atoms have three major sub-particles: Protons (positive particles) and neutrons (particles without any charge) form the nucleus or center of the atom, and electrons (which have negative charges) move around the nucleus. These tiny electrons play a critical role in forming compounds. Elements contain only one kind of atom. Elements may be metals, nonmetals or semimetals. Compounds form when atoms chemically combine. When metals combine (react) with nonmetals, ionic compounds usually form. When nonmetals combine, covalent compounds usually form. Molecules are the smallest part of a compound that have the properties of the compound. Molecules have no charge, meaning the positives and negatives cancel each other out. Ions form when an atom or group of atoms gains or loses one or more electrons, which results in negatively or positively charged particles. Positive ions form when electrons are lost or taken away. Negative ions form when electrons are added. A chemical formula represents the chemical composition of a substance. Writing chemical equations requires understanding how chemical formulas work. Every element has its own symbol. The periodic table of elements shows the elements and their symbols, which are usually the first letter or first two letters of the element's name. A few elements, however, have been known for so long that their symbols derive from their Latin or Greek names. For example, the symbol for lead, Pb, comes from the Latin word plumbum. Chemical symbols with two letters always have the first letter capitalized and the second letter written in lower case. This standard format prevents confusion. For example, the symbol Bi represents bismuth, element 83. If you see BI, that represents a compound made of boron (B, element 5) and iodine (I, element 53). The position of the numbers in chemical formulas provide specific information about the element or compound. The number preceding an element symbol or compound formula tells how many atoms or molecules. If no number appears before the symbol, there is only one atom or molecule. For example, consider the formula for the chemical reaction that forms carbon dioxide, C + 2O → CO2. The number 2 preceding the oxygen symbol O shows that there are two oxygen atoms in the reaction. The lack of a number preceding the carbon symbol C and the compound formula CO2 shows that there is one carbon atom and one carbon dioxide molecule. Subscript numbers in chemical formulas represent the number of atoms or molecules immediately preceding the subscript. If no subscript follows the chemical symbol, only one of the element or compound occurs in the molecule. In the example of carbon dioxide, CO2, the subscript 2 following the oxygen symbol O says that there are two oxygen atoms in the compound CO2, and no subscript following the symbol C says only one carbon atom occurs in the molecule. More complex molecules like the nitrate ion NO3 will be enclosed in parentheses if more than one occurs in the formula and the subscript will be placed outside the closing parenthesis. For example, the compound magnesium nitrate is written as Mg(NO3)2. In this example, the compound has one magnesium atom and two nitrate molecules. Superscript numbers and signs represent the charges of ions. Ions can be individual atoms or polyatomic. Most polyatomic ions have negative charges. Negative charges happen when the number of electrons is greater than the number of protons. Positive charges occur when the number of protons exceed the number of electrons. Many formulas use Latin and Greek prefixes to identify the number of atoms or ions in the compound. Common prefixes include mono (one or single), bi or di (two or double), tri (three), tetra (four), penta (five), hexa (six) and hepta (seven). For example, carbon monoxide has one carbon atom and one oxygen atom while carbon dioxide has one carbon atom and two oxygen atoms. The chemical formulas are CO and CO2, respectively. When naming chemicals, special terms and abbreviations are common. The cation or positive ion uses the element name, with a Roman numeral if the element has more than one possible charge. If only one element forms the anion or negative ion, the second term is the "root" element name with the ending -ide, like oxide (oxygen+ide) or chloride (chlorine+ide). If the anion is polyatomic, the name comes from the name of the polyatomic ion. These names must be memorized, but some common polyatomic ions include hydroxide (OH-), carbonate (CO3-), phosphate (PO43-), nitrate (NO3-) and sulfate (SO42-). Use the following examples to practice writing chemical formulas. Although the name usually shows the order of the atoms or compounds, how do you know which element comes first in a chemical formula? When writing formula, the positive atom or ion comes first followed by the name of the negative ion. The chemical name for common table salt is sodium chloride. 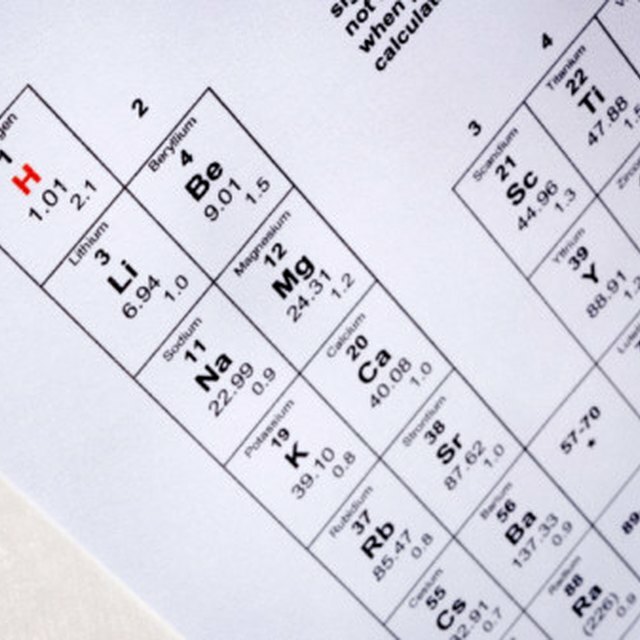 The periodic table shows that the symbol for sodium is Na and the symbol for chlorine is Cl. The chemical formula for sodium chloride is NaCl. The chemical name for a dry-cleaning solvent is carbon tetrachloride. The symbol for carbon is C. Tetra means four and the symbol for chlorine is Cl. The chemical formula for carbon tetrachloride is CCl4. The chemical name for baking soda is sodium bicarbonate. The symbol for sodium is Na. The prefix bi- means two or double, and carbonate refers to the polyatomic ion CO3. The chemical formula therefore is Na(CO3)2. Try writing the formula for a compound named dinitrogen heptachloride. Di- means two or double, so there are two nitrogen atoms. Hepta- means seven, so there are seven chloride (chlorine) atoms. The formula then must be N2Cl7. One of the few positively charged polyatomic ions is ammonium. The formula for the ammonium ion is NH3+. The compound ammonium hydroxide has the formula NH3OH. While it may seem logical to combine symbols so that the formula reads as NH4O, this would not be correct. To correctly write the chemical formula for this molecule the two polyatomic ions, ammonium and hydroxide, are represented separately in the formula. Transition metals can form different ions. The charge will be shown in the compound name as a roman numeral. For example, the compound CuF2 will be written as copper (II) fluoride, determined because the fluoride ion charge is always 1-, so the balancing copper ion has to have a 2+ charge. Using this model, the formula for iron (III) chloride has to be FeCl3 because iron (III) has a 3+ charge. Knowing that a single chlorine ion has one negative charge, the neutral molecule must have three negative chlorine ions to balance the iron (III) ion. More traditional, less standardized names still linger in chemistry, however. For example, many fluoride rinses list stannous fluoride as an ingredient. Stannous refers to tin(II), so the chemical formula for stannous fluoride is SnF2. Other commonly used nonstandard names include ferric [iron(III)], ferrous [iron(II)] and stannic [tin(IV)]. The suffix -ic refers to the form with a higher ionic charge while the suffix -ous refers to the form with the lower ionic charge. G, Karen. "How to Write a Chemical Compound Formula." Sciencing, https://sciencing.com/write-chemical-compound-formula-5749938.html. 27 November 2018.